Rachael Sage will be joining 80's pop pioneer Howard Jones for his nationwide U.S. tour kicking off January 24th in Seattle, WA. Along the tour, Sage will be previewing material from her new album "Myopia", due May 2018. 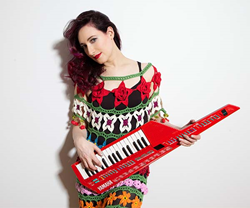 Award-winning singer-songwriter and eclectic multi-instrumentalist Rachael Sage will be joining 80s pop pioneer Howard Jones for his nationwide U.S. tour kicking off January 24th in Seattle, WA. Sage has often named Jones as a seminal influence on her music and previously supported him during the UK leg of his 2017 world tour. Along the tour, Sage will be previewing material from her new album "Myopia", due May 2018. In 2017, Sage was invited to open for Howard Jones during the UK portion of his international tour, which delightfully resulted in a creative kinship between the two. Jones expressed that Sage possesses “wonderful songwriting, arrangements and lovely vocals” and again called upon her to join his upcoming 2018 performances in America. The colorful artists will hit most major markets including stops in Seattle, San Francisco, Los Angeles, Atlanta, Boston, and two nights in New York City. Fans will also be treated to special selections from Sage's forthcoming full-length album, "Myopia", set to release this Spring. Violinist Kelly Halloran (Tom Morello) will be accompanying Sage for all of her performances.